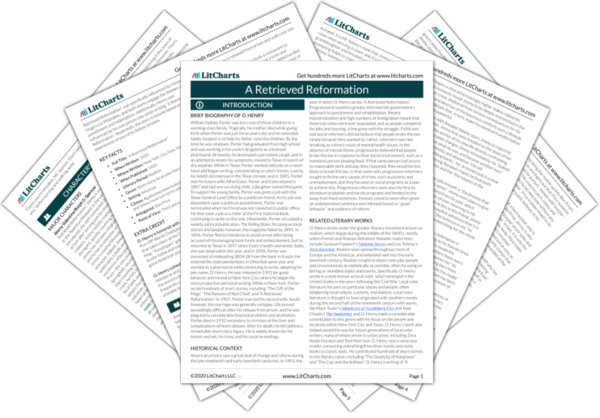 Instant downloads of all 946 LitChart PDFs (including A Retrieved Reformation). Welcome to the LitCharts study guide on O. Henry's A Retrieved Reformation. Created by the original team behind SparkNotes, LitCharts are the world's best literature guides. A concise biography of O. Henry plus historical and literary context for A Retrieved Reformation. A quick-reference summary: A Retrieved Reformation on a single page. 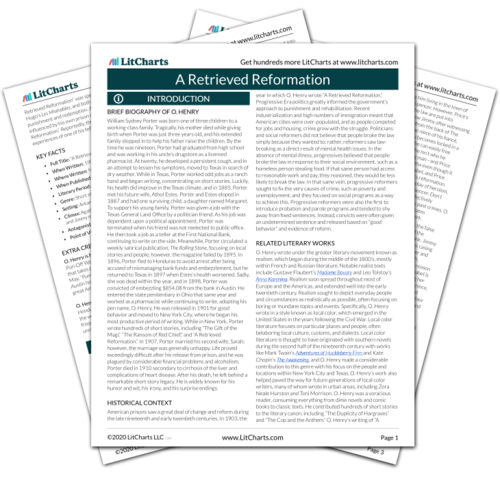 In-depth summary and analysis of every of A Retrieved Reformation. Visual theme-tracking, too. Explanations, analysis, and visualizations of A Retrieved Reformation's themes. A Retrieved Reformation's important quotes, sortable by theme, character, or . Description, analysis, and timelines for A Retrieved Reformation's characters. Explanations of A Retrieved Reformation's symbols, and tracking of where they appear. An interactive data visualization of A Retrieved Reformation's plot and themes. William Sydney Porter was born one of three children to a working-class family. Tragically, his mother died while giving birth when Porter was just three years old, and his extended family stepped in to help his father raise the children. By the time he was nineteen, Porter had graduated from high school and was working in his uncle’s drugstore as a licensed pharmacist. At twenty, he developed a persistent cough, and in an attempt to lessen his symptoms, moved to Texas in search of dry weather. While in Texas, Porter worked odd jobs as a ranch hand and began writing, concentrating on short stories. Luckily, his health did improve in the Texas climate, and in 1885, Porter met his future wife, Athol Estes. Porter and Estes eloped in 1887 and had one surviving child, a daughter named Margaret. To support his young family, Porter was given a job with the Texas General Land Office by a politician friend. As his job was dependent upon a political appointment, Porter was terminated when his friend was not reelected to public office. He then took a job as a teller at the First National Bank, continuing to write on the side. Meanwhile, Porter circulated a weekly satirical publication, The Rolling Stone, focusing on local stories and people; however, the magazine failed by 1895. In 1896, Porter fled to Honduras to avoid arrest after being accused of mismanaging bank funds and embezzlement, but he returned to Texas in 1897 when Estes’s health worsened. Sadly, she was dead within the year, and in 1898, Porter was convicted of embezzling $854.08 from the bank in Austin. He entered the state penitentiary in Ohio that same year and worked as a pharmacist while continuing to write, adopting his pen name, O. Henry. He was released in 1901 for good behavior and moved to New York City, where he began his most productive period of writing. While in New York, Porter wrote hundreds of short stories, including “The Gift of the Magi,” “The Ransom of Red Chief,” and “A Retrieved Reformation.” In 1907, Porter married his second wife, Sarah; however, the marriage was generally unhappy. Life proved exceedingly difficult after his release from prison, and he was plagued by considerable financial problems and alcoholism. Porter died in 1910 secondary to cirrhosis of the liver and complications of heart disease. After his death, he left behind a remarkable short story legacy. He is widely known for his humor and wit, his irony, and his surprise endings. 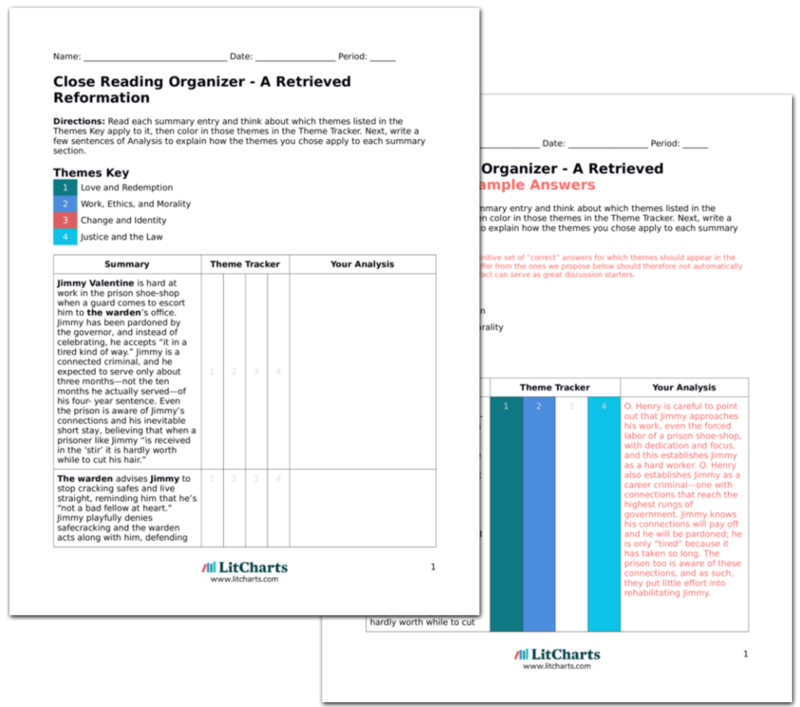 Get the entire A Retrieved Reformation LitChart as a printable PDF. American prisons saw a great deal of change and reform during the late nineteenth and early twentieth centuries. In 1903, the year in which O. Henry wrote “A Retrieved Reformation,” Progressive Era politics greatly informed the government’s approach to punishment and rehabilitation. Recent industrialization and high numbers of immigration meant that American cities were over-populated, and as people competed for jobs and housing, crime grew with the struggle. Politicians and social reformers did not believe that people broke the law simply because they wanted to; rather, reformers saw law-breaking as a direct result of mental health issues. In the absence of mental illness, progressives believed that people broke the law in response to their social environment, such as a homeless person stealing food. If that same person had access to reasonable work and pay, they reasoned, they would be less likely to break the law. In that same vein, progressive reformers sought to fix the very causes of crime, such as poverty and unemployment, and they focused on social programs as a way to achieve this. Progressive reformers were also the first to introduce probation and parole programs and tended to shy away from fixed sentences. Instead, convicts were often given an undetermined sentence and released based on “good behavior” and evidence of reform. O. Henry wrote under the greater literary movement known as realism, which began during the middle of the 1800’s, mostly within French and Russian literature. Notable realist texts include Gustave Flaubert’s Madame Bovary and Leo Tolstoy’s Anna Karenina. Realism soon spread throughout most of Europe and the Americas, and extended well into the early twentieth century. Realism sought to depict everyday people and circumstances as realistically as possible, often focusing on boring or mundane topics and events. Specifically, O. Henry wrote in a style known as local color, which emerged in the United States in the years following the Civil War. Local color literature focuses on particular places and people, often belaboring local culture, customs, and dialects. Local color literature is thought to have originated with southern novels during the second half of the nineteenth century with works like Mark Twain’s The Adventures of Huckleberry Finn and Kate Chopin’s The Awakening, and O. Henry made a considerable contribution to this genre with his focus on the people and locations within New York City and Texas. O. Henry’s work also helped paved the way for future generations of local color writers, many of whom wrote in urban areas, including Zora Neale Hurston and Toni Morrison. O. Henry was a voracious reader, consuming everything from dime novels and comic books to classic texts. He contributed hundreds of short stories to the literary canon, including “The Duplicity of Hargraves” and “The Cop and the Anthem.” O. Henry’s writing of “A Retrieved Reformation” was specifically influenced by Victor Hugo’s Les Misérables, and both works engage the themes of punishment and redemption. Additionally, Henry was influenced by his own prison stay while writing “A Retrieved Reformation.” Reportedly, the story is loosely based on the experiences of one of his fellow inmates. Climax: Agatha becomes locked in her grandfather’s safe, and Jimmy must turn to his safecracking skills to free her. O. Henry is honored with a yearly “pun-off.” The O. Henry Pun-Off World Championship is a spoken word competition that takes place at the O. Henry Museum in Austin, Texas each May. “Punslingers” gather in the backyard of O. Henry’s former Austin home and trade witty remarks as a way to remember the great American storyteller. O. Henry coined the term “banana republic.” While living in Honduras and writing Cabbages and Kings, O. Henry invented the word to describe the setting of his stories. The term is now frequently used to describe small Latin countries with an unstable farming-based economy. Rosewall, Kim. "A Retrieved Reformation." LitCharts. LitCharts LLC, 13 Nov 2018. Web. 11 Dec 2018. Rosewall, Kim. "A Retrieved Reformation." LitCharts LLC, November 13, 2018. Retrieved December 11, 2018. https://www.litcharts.com/lit/a-retrieved-reformation.